No rest on day 1 of spring break. We were up at the normal time. Ashley had to be at the dentist at 7:50 a.m. She did a great job at the dentist. 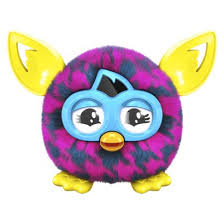 It's a furbling - it is the baby that goes along with the furby boom. You play the furby boom with your tablet or Ipad or IPhone. Of course our furby boom or furbling is not scanning on our tablet and she is using my IPhone to play with the furbies. I think I know what my summer drive money is going to an Ipad. It was nice after the dentist Ashley and I went to Atlanta bread. She loves to have hot chocolate out. Then I went off to a meeting at DCFS for "Little D". Ugh if only I could change the system. Bio mom did not show up..... Next court date is June. It's so unfair kids do not deserve to be treated like this. Tonight "Little D" had his O.T. appointment. He is improving just after a few sessions. So that is encouraging. I love his therapist. I am excited no alarms set for tomorrow morning. I will have to see what Ashley has on the agenda for us tomorrow.